The Grand Carerra CAV511A.FC6225 by TAG Heuer. 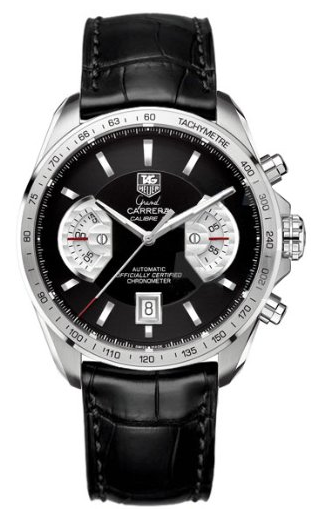 The Grand Carerra collection by TAG Heuer was inspired by the racing heritage of GT cars, and it definitely shows on the TAG Heuer Grand Carerra CAV511A.FC6225 Men’s Chronograph Calibre 17 RS designer watch. The RS in the model’s full name stands for Rotating System, which uses dashboard style discs with permanent hands at the 3 and 9 hour marks. Prominently featured in the black dial of the Grand Carerra CAV511A.FC6225 are two white chronograph dials displaying 30 minutes and 60 seconds behind two Cotes-de-Geneve finished steel rimmed semi-circular windows. Screw-in push-buttons on either side of the crown operate the chronograph feature, which is officially certified by the prestigious Swiss Office of Chronometry for meeting the standards of high precision and quality. Inscribed on the fixed stainless steel bezel is tachymeter scale, which is a tool for figuring out the average speed of a vehicle or object by measuring how much time it takes to cover a specific distance, usually a mile or a kilometer. The Grand Carerra CAV511A.FC6225 comes with a stylish black alligator leather wristband and fold-over clasp with double-push button that prevents accidental opening. It connects firmly to either side of the 43 millimeter stainless steel case like a dashboard on either side of a steering wheel. This is the interior of a high-performance sports car, not a race car, but the visual similarities are still evocative. And very cool. This watch is water resistant to 100 meters (328 feet). It’s face is protected by scratch-resistant sapphire with double anti-reflection treatment. And if you flip the watch over, there’s sapphire crystal also fitted into the screw-down back of the case to show off the Calibre 17 RS Swiss automatic movement. For increased visibility, the silver-tone bar hour markers and hands of the Grand Carerra CAV511A.FC6225 are specially coated to glow in the dark. In good light, they already stand out well on the black two-tiered guilloche dial, the outer tier of which is textured with a fine concentric circle pattern. There is a white date display at the six hour mark. There are a few other watches out there with dial layouts similar to this model. 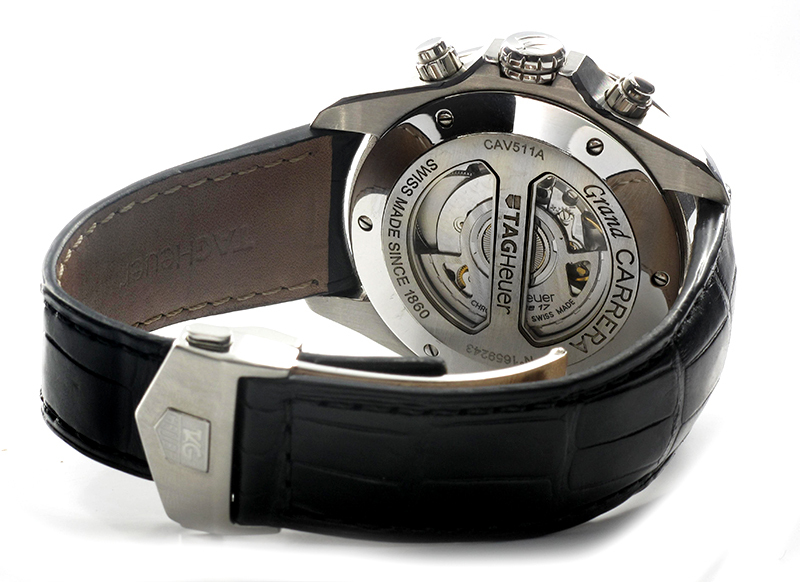 Among them are Grand Carerra CAV511B.FC6225, with silver-tone dial and black leather wristband, the Grand Carerra CAV511B.FC6231, with silver-tone dial and brown leather wristband, and the Grand Carerra CAV511E.BA0902, with brown-tone dial and stainless steel wristband. It’s a pretty nice selection, and the retail price for each of them is $6600. If that fits your budget, the TAG Heuer Grand Carerra CAV511A.FC6225 Men’s Chronograph Calibre 17 RS is a very cool-looking choice.